I found about this great 3-part documentary of Go from CCTV. Here is also a direct link in case you don’t see the embedded version below. Thanks to youtube user semedori for uploading this. 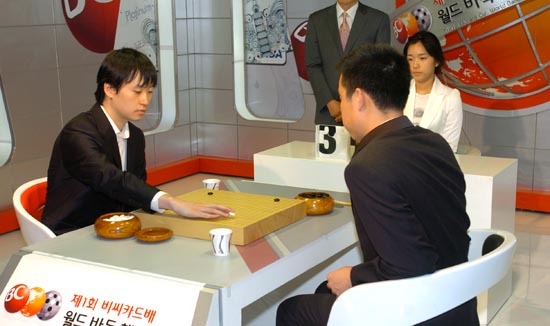 Second game of the best-of-seven title match for the Honinbo title started yesterday, and it will be concluded today. Here is a photo of Hane Naoki, title holder, handing the sealed move to the referee, Kobayashi Koichi. Found this here and here. For the previous entries in the same series, see here and here. The 30th WAGC (World Amateur Go Championship) started in Shizuoka, Japan. This year there are 70 players from 70 countries. The International Go Federation has clearly made a good job in spreading Go and more and more countries over the years. Round one is over. No surprises here: the strong Asian countries (Korea, China, Japan, Taiwan) have all won. Everybody is wondering if any non-Asian country will end up in the top three. If anyone would accomplish this performance, it would be one of the players of US (Eric Lui), Czechia (Ondrej Silt, ex-insei) or Hungary (Csaba Mero, ex-insei) – all these won first round as well. Here are some interesting interviews with some participants on the Ranka webpage. Also, one can follow the tournament results so far here and see the game records here. 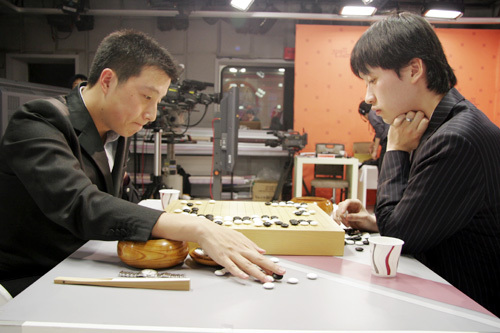 Hane Naoki won the first game in this year’s Honinbo title match by 2.5 points against the challenger Takao Shinji. Interestingly, last year’s Honinbo title match was played by these same players, but with roles reversed. Last year Takao Shinji was the title holder and won the first 3 games. Hane Naoki put up an extraordinary next and won all of the following four games. 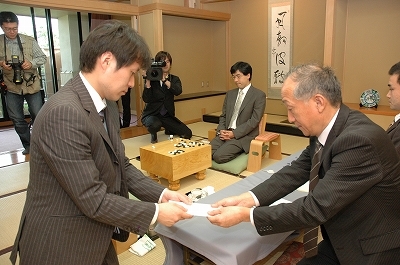 Here is a photo of Takao Shinji handing the sealed move at the end of day one. The next game will be played on May 27, 28. Fujisawa Shuko Sensei passed away earlier today at the age of 83. Shuko Sensei was born on June 14th, 1925. He is mostly famous for winning Kisei, the top Japanese title in his 50s for six times in a row, from 1976 to 1981. More details about his career can be found here. I recently posted a video from a study group meeting organized by Shuko Sensei. I’m adding the video below. English article from Mainichi here. The announcement (in Japanese) on the Nihon Ki-in website is here. Here are some thoughts on Shuko Sensei from Cho Hye Yeon. Photos from the funeral service here. Some recent photos with Shuko Sensei. You are currently browsing the 361points.com/blog blog archives for May, 2009.